The newly remodeled 2014 Subaru Forester is not only a great new SUV for families, but it’s one of the safest on the planet. See what new safety test the Forester aced. Families who are looking for a new mid-size SUV want a number of features that will makes their life easier. The all-new 2014 Subaru Forester offers a number of things like a larger interior with more utility, a new powerful engine and better fuel-efficiency. But what many buyers don’t think about is how safe a vehicle is. Most automakers need to make their vehicles lighter to meet the fuel mileage standards which can effect their ability to be safe in the event of a crash. But the new Forester is one of the safest new SUV’s on the planet. What did Subaru do to ace an important new safety test? The 2014 Subaru Forester is the first vehicle ever to ace every aspect of the challenging small overlap front crash test conducted by the IIHS. This makes the Forester one of the safest SUV’s on the planet. It helped the new SUV to be awarded a Top Safety Pick+ (TSP+) award from the Insurance Institute for Highway Safety (IIHS). And the Forester is not new to high safety standards. When the Institute first rated small SUVs for side protection in 2003, the Subaru model performed the best and was one of only two vehicles to earn good ratings. 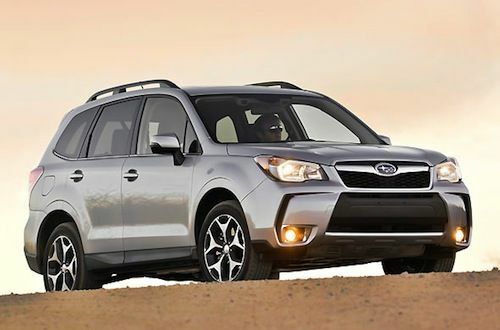 Subaru announced an even bigger accomplishment for the Forester in the IIHS safety tests that were recently conducted. The Forester is the only SUV out of 13 small SUVs to earn an overall rating of good in the test. When families climb aboard the newly designed Forester, they can know they will be safe. The Subaru brand has some of the safest vehicles on the planet and has been rated high in the area of safety for many years. And it isn’t just the new Forester that has tested well by the IIHS. Subaru is the only manufacturer with 2013 IIHS Top Safety Pick for all models and the only brand with IIHS Top Safety Picks for all models for four years running (2010-2013). The 2013 Subaru Legacy and 2013 Subaru Outback (built after August 2012) were awarded the Institute’s 2013 TSP+ designation in late-2012. Safety is not something the Japanese automaker has just begun to incorporate in their cars. Subaru has been testing their cars since the 1960’s before safety testing methods had yet to be established. The whole Subaru lineup along with the new Forester has won high praise around the globe. Families who are looking for the safest small SUV need to look at the new 2014 Subaru Forester as it continues the tradition of safety for the brand.